There are three main styles of French restaurants but the bistro and café are perhaps most familiar to Americans. Images or memories of intimate rooms with tables for two, mottled mirrors reflecting bottles at the bar and walls displaying framed pictures of Parisian streetscapes or French travel posters may come to mind. The food served could be simple or fussy, hardy or light, moderately priced or expensive, and almost always with some sort of Continental influence. The cafés would feature the less expensive foods, perhaps not serve any alcohol and usually make excellent coffee. Then there’s the brasserie. When we built Brasserie L’Oustau in late 2011 we found many people were unfamiliar with the brasserie restaurant. (The best way to pronounce it would be to say the woman’s undergarment plus a type of horse-drawn carriage: bra + surrey.) To be sure, a brasserie is as original to France as a bistro or café but it is also very unique and well-defined. There are few authentic brasseries in America, and we are one of them; we have had world-traveling customers tell us our design and menu are the closest to a traditional Paris or New York brasserie that they’ve ever seen, and this is our greatest compliment. A Bit of History: The French word “brasser” translates as the verb “to brew” which gives you insight to how the brasserie originated. In villages throughout France the local brewery is a most important member of the business community and well supported by the citizens. A restaurant inside a brewery is a natural development. I imagine a summer lunch break or walking home after a full day of agricultural work sometime in the early 1800’s when the men and women longed for a relaxing draught of beer and a moment of socializing. They might enter the village’s cool and lofty brewery to sidle up to a counter where the proprietors would swiftly offer a taste of the most recent tap. One glass, two perhaps, and food might be the next request. But these proprietors were brewers, not restaurateurs. The food provided would be simple family fare from the region, familiar to all their customers and easy for the owners to prepare and keep for spontaneous requests. The brasserie restaurant would serve foods like paté and cured meats, cheese boards with bread, confit, long-simmering soups and fresh salad greens from the house gardens. The dishes would be hearty, affordable and familiar. The ambiance is relaxed, a bit noisy from clattering plates and mugs, and everyone is enjoying themselves. 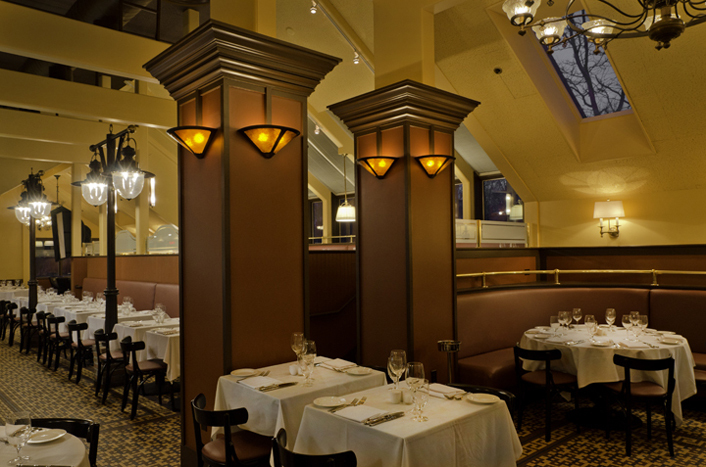 The interior design of Brasserie L’Oustau is simultaneously grand, warm, comfortable and inviting. At Brasserie L’Oustau we aspire to define and interpret the essence of a French brasserie here in rural Vermont. After searching for many months, we were fortunate to find a building which could have easily fit many large beer casks, and it had already been operating as a restaurant for more than 20 years. After two months’ renovation, we had transformed an American pizza and barbeque restaurant into our French brasserie with a vast bar, tile floors, brass railings, banquettes, large mirrors, warm hues of gold and chocolate brown and an extensive list of beers to complete our full drink menu. There will be articles about some of these details but be assured they are all ubiquitous to a brasserie. Our menu reflects the traditional fare of French brasseries, and many of these dishes will be discussed as we tend to this blog. 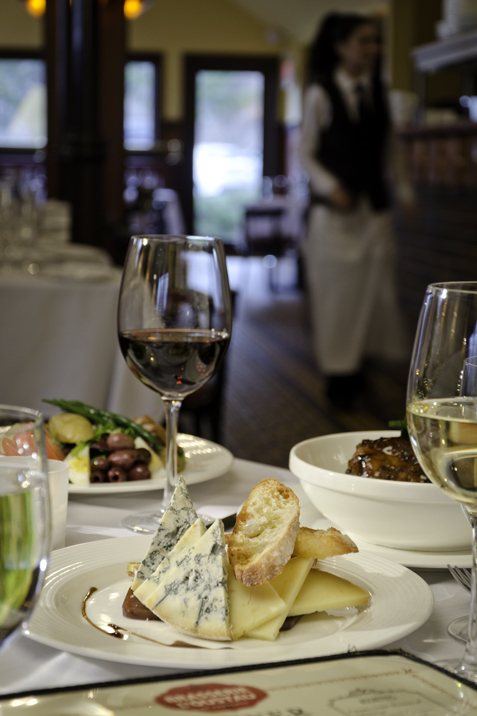 The current menus can be viewed on our website where you might find a brandade de morue or steak tatare appetizer (featured in the previous article), warm duck confit salad or moules frites — all familiar to today’s brasserie menu. Not the least important, serving staff at Brasserie L’Oustau are trained in the classic French service paradigm and wear the traditional uniforms of white shirts, black ties and vests, and floor-length white aprons. The training requires strict attention and takes many hours to complete, but we insist on maintaining a high level of service for our customers’ needs. This may not have been true for the first brasseries in France, but breaking with tradition in this way is a good thing.